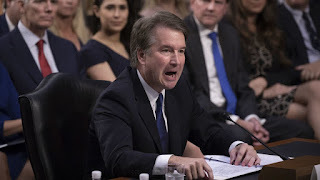 As I write this, another accuser has come forth accusing Kavanaugh of sexual impropriety. This one from college. Like the Ford charge, there are manifold problems, among them the lack of corroboration. They are charges that would have no force in a court of law and the Ramirez charge shouldn't even have been published by the normal standards of journalism (or at least the ones that used to be normal until ideology completely consumed ethical considerations among America's left-wing media). In fact, there was a reason several other major mainstream news sources passed on the Ramirez charges (at least according to several reports): There was simply no corroboration of the charge and she wasn't even certain of what had happened until she had six days with people who had a political interest for her to remember it just right before she had any "clarity." If these charges prove enough for Republicans to back down, then no one is safe. No conservative nominee will ever be confirmed. Let's be clear on a couple of things. First, we would not be where we are if Republican leaders in the Senate had done what they were supposed to do, which was to stick with proper protocol and go ahead with the originally scheduled vote. In diddling around they have lent credence to charges that of themselves have little credibility. This is what happens when you don't have the courage of your convictions and instead start putting political calculation above what you know to be right. If they had gone ahead with the originally scheduled vote, the Ford charges would rightly be receding in the rear-view mirror of ignobility, and Ramirez would still be sorting out whether anything really happened. Second, Tucker Carlson is right. I normally refrain from quoting Fox News hosts, since journalistic standards there can sometimes be as low as those at CNN. But it's a fact: If congressional Republicans can't confirm Kavanaugh, then there is no reason to vote for them. Yes, Republicans are in a dilemma, but they are the ones who put themselves in it in the first place. Now their choice is between placating the left or responding to their conservative constituency. Choosing the former means they're irrelevant. Choosing the latter will cost them, but they will only have themselves to blame. Letting the left win now will only mean that they will win again and again and again.